To stand a chance of limiting warming to 1.5 degrees, we need a systems change, and we need it fast. By 2030, global emissions need to decline by about 45 per cent from 2010 levels. Waiting means we will have a high overshoot above 1.5°C, with dangerous consequences. The global energy system plays a pivotal role. In all scenarios, fossil fuels need to be dramatically reduced. Scenarios show the importance of removing emissions from fossil fuels and industry . This is much higher than the smaller contributions of bioenergy with carbon capture and storage and removals in agriculture, forestry and other land use (see p.19 of the Summary for Policy Makers). Fiscal policies are another important piece of the puzzle. The IPCC report explains how no single policy, including carbon pricing or fossil fuel subsidy reform (FFSR), will work alone. But fiscal policies such as FFSR or taxation would create the necessary enabling environment (“lubricant”) for other low-carbon policies to take off. The IPCC report highlighted carbon pricing, fossil fuel taxation and FFSR to reduce emissions in Chapter 4, Strengthening and Implementing the Global Response. This includes shifting the finance, putting in place the policies to direct the shift and encouraging populations to respond: low-carbon energy and energy efficiency need to increase. It’s time to turn around quickly. Removing subsidies and taxing carbon can go a long way. Research from earlier this year shows how FFSR, could deliver carbon emission reductions of between 0.5 and 2 Gt, or between 1 and 4 per cent, globally by 2030. This is around a quarter of the combined effort currently proposed by countries for emissions reductions from fossil fuels and industry as part of the Paris Agreement. Like the IMF, this research also found that, without reform, fossil fuel subsidies would reach between USD 550 billion and 970 billion in 2030, or 1 per cent of world GDP. This is a huge lost opportunity for governments. Governments can save money and reduce emissions by removing subsidies to fossil fuels. Many countries are indeed reforming subsidies. There is an opportunity to include FFSR in the next round of NDCs to increase ambition. Currently only 9 per cent of NDCs include FFSR or energy pricing. In the short term, there are emissions reductions and budgetary savings from removing subsidies or increasing taxes on fossil fuels. At the same time, governments need to shift energy policy and direction toward low-carbon energy pathways. 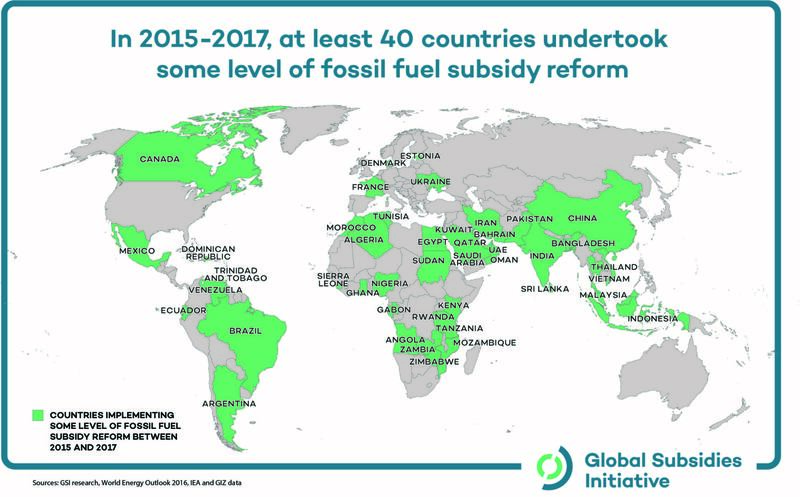 Recent work by the Global Subsidies Initiative of IISD has shown how reforming subsidies to fossil fuels can enable a switch to renewable energy to get onto a different energy path. Shifting funds saved from FFSR into renewables, energy efficiency and public transport can accelerate the energy transition, for example in India (with a shift from kerosene subsidies to solar ones), Indonesia (between coal and renewables), Morocco (from gas to solar), Bangladesh (toward solar power and safety nets) and Zambia (reforms alongside industrial energy efficiency). Indeed, any country reforming subsidies to fossil fuels could make this swap. With a big focus on shifting investments toward adaptation and mitigation, governments could start with where they have the most control and where they can benefit most from savings. Actively changing policy and directing those energy subsidies away from fossil fuels and toward sustainable energy could shift us onto energy pathways consistent with staying within 1.5°C. The question is: what are we waiting for? The IPCC report is available to download here. More information on the climate impacts of fossil fuel subsidies is available on producer subsidies here and on consumer subsidies here.